The Chinese Gold Panda is one of the world's most popular bullion coins. It has been issued by the People's Republic of China every year since 1982. This much-loved coin features the lovable giant panda, a symbol of China that is recognised around the globe and, apart from 2001 and 2002, the China Gold Panda has changed its design each year. Mintage is strictly limited and Chinese Pandas are available in a range of sizes; coins issued between 1982 and 2015 include favourites like the 1oz Gold Panda and various fractional coins. The Panda is produced by several mints, including Beijing, Shanghai, Shenyang and Shenzhen and, in 2016, Gold China Panda coins were minted according to the metric system for the first time with 30g, 15g, 8g, 3g and 1g. We are pleased to offer a wide range of attractively priced VAT Free China Gold Panda coins for fast, insured shipping at coininvest.com. Chinese Panda gold coins are favourites amongst collectors for the rarity, numismatic value and original designs. One of the main appeal of the China Panda is the design changes on an annual basis so that no two coins are ever the same – they are also arguably the most consistently eye-catching designs of any gold bullion collection. The People’s Republic of China Mint only produce a limited number of Chinese Panda Gold coins a year so if you want the latest edition we recommend placing your order well in advance. However, CoinInvest GmbH store a reasonable selection of current and past issues which are available to buy online. To buy China Panda gold coins click on your preferred choice above and add the product to your shopping basket by clicking on the “add to basket” highlighted by the orange band. It should be noted that the value denoted on the coins only represents their face value and is not the actual cost of the coin, nor the price you should expect to receive if you decide to sell. The true value of gold bullion coins is calculated based on the current spot price which is available online and is far greater than the values of the coins represented in Yuan. The Chinese Panda is one of the world’s most recognisable and best loved animals in the world so it should come as no surprise that the People’s Republic of China chose the Panda as the main feature of the country’s bullion coins. 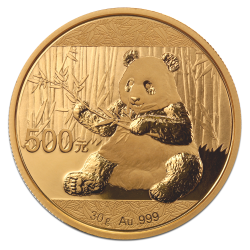 First introduced in 1982, the China Panda gold coin is available on a variety of sizes, most typically one ounce although smaller denominations including the ½ ounce, ¼ ounce, 1/10 ounce and 1/20 ounce make the coins more accessible to everyday investors and give buyers the opportunity to present the coins as a gift to cherish. The gold edition coins can also be found in larger sizes including the five ounce, 12 ounce and even a kilo. Made from .999 these size coins are extremely rare and valuable. Chinese Panda coins are also available in silver, Palladium and Platinum so there is something for everyone. One of the most appealing features of the China Panda coins is that the design changes every year which makes them unique. Because the China Mint only issue a limited amount each year the coins are extremely popular among collectors for their rarity and numismatic value. The only exception to this rule was in 2001 and 2002 when the China Mint decided to put a freeze on the design, but following widespread complaint resorted back to the tradition of introducing a new design each year. The Mints engravers submit a design each and compete for the honour of having their creation selecting for the coins. China Panda coins are intricately designed and are arguably the most impressive bullion coins to be manufactured each year. Credit should be given to the Chinese Mint for producing their bullion coins with a different design each year. However, although the fundamentals of the designs are different the features remain the same. In China, the obverse features the Temple of Beijing and the Panda on the reverse, but the rest of the world have this the other way round – in a similar way that peoples from the Far East read their books from back to front rather than front to back. In Europe, the obverse of the coins depicts the famous Panda bear with it is distinctive round face and black eyes. The Panda is typically depicted holding or chewing a bamboo shoot and poses in its meek, unrestrained temperament that it is known and much loved for. It is perhaps for this reason that Panda coins have such an endearing touch. The face value of the coin is also displayed on the obverse, typically, 5, 50, 100, 200 and 500 Yuan. You will also find the weight represented by oz. and the figure .999 represented the coins purity in gold. Three 9’s mean the coins contain 99.9% gold content and are therefore 24 carat. The reverse of the coins depict the famous Temple of Heaven in Beijing which is another national symbol representing China’s illustrious history. The coins typically feature a border engraved with the year of issue and ancient scriptural writing which translate to modern Chinese as Zhonghua Renmin Gongheguo, simply meaning People's Republic of China. The Chinese Panda is produced at several Chinese Mints that are spread around the cast country. The main Mints are at Beijing, Shenzhen, Shanghai, and Shenyang. Issued as legal tender in China their face value denominations were originally 500, 200, 100, 50, 25, and 10 Yuan. The 5 Yuan coin was added in 1983 to make the coins accessible to poorer buyers. The face values correspond to the weight of the coin which starts with one troy ounce at 500 Yuan, the half-ounce at 200 Yuan and so on through the quarter ounce, tenth and twentieth. In 1991, a one gram gold Panda was minted and issued in denominations of three Yuan. The only other exceptions are the 5 kilo gold Panda which weigh 11 pounds and is the size of a car wheel’s hub plate. The China Panda is struck in gold, silver, Palladium and Platinum and is made to extremely high standards. The exact minting process however is unknown due to the dissemination of the information allowed by the government censoring imposed by the People’s Republic of China. As leading dealers in the UK and Europe, CoinInvest is are always keen to purchase China Panda coins and guarantee to offer competitive market rates based on current spot prices. If you are interested in receiving a quote from us please contact a member of our friendly staff who will prepare an offer for you and confirm the same by email.